Posh full-back Michael Smith during his recent Northern Ireland debut. 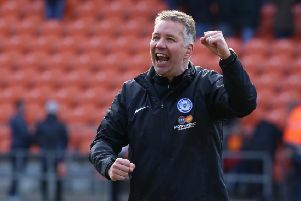 Peterborough United may have run their race in League One, but Michael Smith’s season is far from over. The 27 year-old right-back is still bursting with pride after making his senior Northern Ireland debut in a 1-0 win over Slovenia last week. Ollie Conmy won one Republic of Ireland cap while a Posh player. Smith’s aim now is to force his way into his country’s squad for the Euros Finals in France this summer. Northern Ireland have one friendly match to play against Belarus in Belfast on May 27 before the Euros squads have to be announced. Squads for France have to be submitted by May 31. Smith has his fingers, and everything else, crossed. Gaby Zakuani is now Posh's most-capped international player. Photo: Joe Dent/theposh.com. “I’m very, very proud to say that I am a Northern Ireland international footballer,” Smith stated. “It’s a dream come true and I hope I get to play for them again as I loved every minute of my debut. “It was a thrill to be told I would be playing - I only told my mum beforehand! - and being selected has given me a lot of confidence in my game. “The manager spoke to me after the game and assured me there are places for France still up for grabs so I have a chance. “He said lots of players will be watched between now and the end of the season so it’s up to me. “I actually refuse to accept that our season at Posh is over. “Never say never is my approach. We will try and win every game we have left and see where we end up. “I’ve enjoyed most of the season. I enjoy being asked to attack. Northern Ireland have a tough draw at the Euros with Poland, Ukraine and Germany in their group. Smith is the 18th player to win a full international cap while a Posh player. The others are: Ollie Conmy (Republic of Ireland), Frank Rankmore, Tony Millington & Craig Morgan (Wales), Trevor Anderson, James Quinn, Danny Sonner & Grant McCann (Northern Ireland), Helgi Danielsson (Iceland), Adam Newton, Calum Willock & Sagi Burton (St Kitts & Nevis), Andre Boucaud (Trinidad & Tobago), Craig Mackail-Smith and George Boyd (Scotland), Gaby Zakuani (DR Congo) and Kgosi Ntlhe (South Africa). Boyd made his Scotland debut while on loan at Hull from Posh. Zakuani made his 20th international appearance for Dr Congo while a Posh player last week. He now goes past Craig Morgan as Posh’s most-capped player. Senior caps while a Posh player: 20 Zakuani, 19 Morgan, 11 Quinn, 9 McCann, 8 Millington, 6 Boucaud, 4 Anderson, 4 Sonner, 3 Burton, Newton, 2 Willock, 1 Conmy, Danielsson, Mackail-Smith, Boyd, Ntlhe, Rankmore, Smith.